Fluoropolymer coatings from Metal Coatings Corp. have solved problems in many industries and applications. FluroKote #1® is the perfect replacement for traditional metal coatings such as zinc or cadmium plating. Due to its unique benefits, FluoroKote #1® has been used for various types and grades of fasteners. The waterworks industry takes advantage of the superior corrosion resistance properties by coating T-head bolts for underground service. Stainless steel fasteners, used in many different industries, are coated for lubricity and anti-galling. 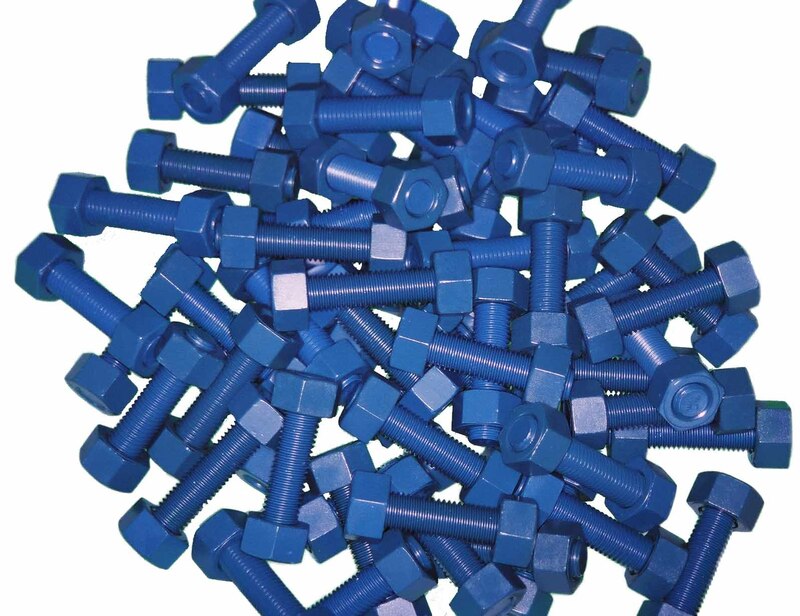 The most widely used application is on B7 studs with 2H nuts. These fasteners are commonly used by turnaround groups, operations and maintenance departments, and contractors at many chemical plants, refineries, and offshore platforms. Metal Coatings Corp. maintains a huge stock of coated B7 studs, threaded bar and 2H nuts. Available for same-day shipping in a wide variety of sizes, each is expertly coated with the proprietary FluoroKote #1® fluoropolymer coating process that offers easier assembly, fights corrosion and prevents seizing and galling.